Merely five days after her graduation from Yale University in 2012, Marina Keegan was tragically killed in a car accident. Yet, her voice lives on through the compilation of her essays and short stories in “The Opposite of Loneliness”. 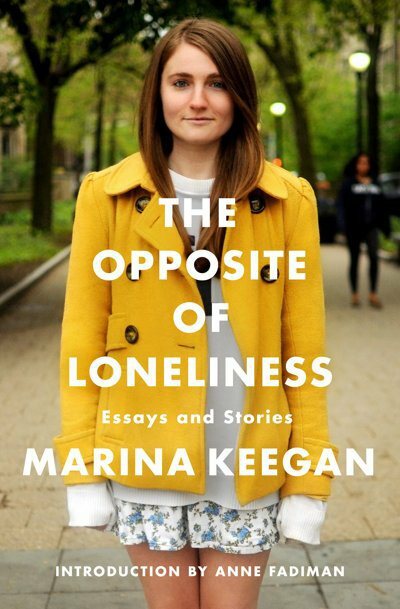 Named after her final piece for the Yale Daily News, “The Opposite of Loneliness”, is Keegan’s retrospective narrative on her time spent at Yale. The essay, tinged with hopefulness of her promising future (she had a job lined up at the New Yorker), is a fine representation of Keegan’s dynamic prose and developing voice that certainly would have prospered. Gone far before her time, Keegan leaves behind an excellent compilation, ranging from a self-depracating piece on her gluten allergy, to a satirical piece of an exterminator titled “I Kill for Money”. Her range, wisdom beyond her years, and voice leave readers inspired, yet unsatisfied, as they know she would’ve continued on to remind us “what everyone else had been thinking but no one else had been brave (or brazen) enough to say”, as Anne Fadiman states in the introduction. Divided into two sections- nine non-fiction pieces followed by the eight piece fiction section, Keegan chronicles various demographics, countries, lifestyles, and even tackles the big picture questions- why we are here and why we are the way we are. What keeps readers interested is Keegan’s strong voice, apparent insight, and wisdom well beyond her years. Depicting tales of young love and heartbreak, with “Cold Pastoral” and “Winter Break”, it’s as if Keegan has found the baseline of sentiment within all readers and deliberately tugs at their repressed heartstrings. She is completely genuine and relatable, and a fair representation of the honesty we are hesitant to express. Humble, yet relatable, she admits “I don’t pretend to know any more about this world than the rest of us. In fact, I probably know less.” Overall, her blunt tone and pragmatic, yet soft voice explain her deserved success. Her loss is painful, even to those who never knew her, as she will surely be celebrated as an instant classic, gone much too soon. Previous Do I Wanna Know?